2019 John Deere Z720E 54 in. Heavy-duty design delivers strength and durability. Three-position, adjustable foot platform to accommodate different size operators. Smooth and powerful V-twin engine for performance and long life. 8-gal. 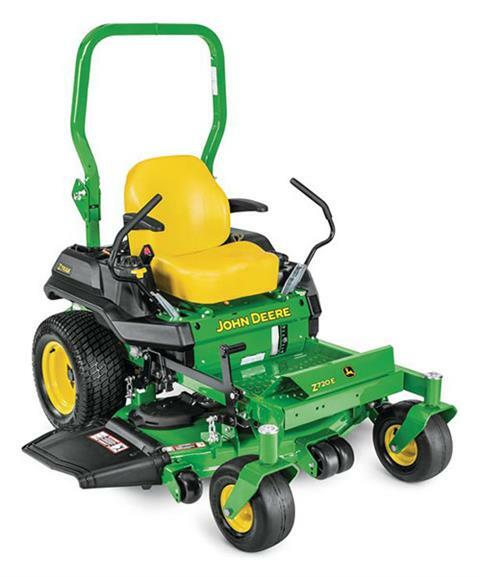 (30.3-L) fuel capacity for extended mowing times. Transmission offers speeds up to 8 mph (12.8 km/h) to maximize mowing efficiency. Operator station is adjustable for superior comfort. High-quality seat with adjustable armrests and springs for extra comfort. Controls, including an automatic motion-control lever/parking brake system, are easy to find and use. Serviceability is designed-in for convenience. High-capacity (HC) PRO Mower Decks offer superior cut quality and versatility.